REFLECT: How do we learn to "approve what is excellent?" 2 - Identify something you have approved as excellent due to its connection with the Creator. 3 - List other items, people, or activities you once saw as excellent but can not be approved as excellent. 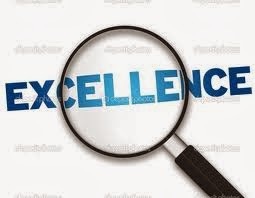 I associate excellence with high standards, outstanding quality, positive attitudes, and sincere efforts. Tithing is an excellent activity as it allows us to give back to the Lord what is His in the first place. I do not see it as an obligation but as a way of thanking the Lord for blessing me and also as a way to help my church community in its mission to serve others. It is a humbling experience because it is a personal exchange between God and myself. No one sees how much I give; therefore, there is no glory given to myself. P.S. TGIF, happy Valentine's day, and to those who got hit by the snowstorm madness these past few days.. stay safe and warm!